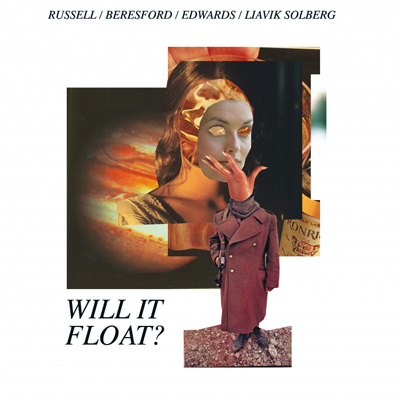 ‘Will it Float?’ is the collaboration between improvisation magicians Russel, Beresford and Edwards, together with solo artist Liavik Solberg. The trio, veteran in conjuring improvisation music, has locked horns with Solberg for this sonic experimentation in floatation, resulting not only in a chaotic creation, but also a joyous, or at least a playful one. These four artists create musical microscopic landscapes, vibrating like seismographs while writing down the results of their wild playing. John Russell plays the Guitar, Steve Beresford is on Electronics and various other unknown objects, John Edwards is on Double Bass and Stale Liavik Solberg is on Drums and Percussion. As loosely mentioned earlier, ‘Will it Float?’ is an improvisation show that goes deep into microscopic levels of sound, like in the track “Buoyant”, where the smallest clicks and broken guitar notes create a vapor cloud of nano-particles, all formed into one huge body. I can only imagine how a live show can be even more impressive than the recorded album, but this great creation should be grabbed immediately by all fans of improvisation music and free jazz.